Deep in the remote southwestern corner of North Carolina where the scenic Cherohala Skyway climbs to meet Tennessee at Beech Gap, the Bob Bald Connector Trail (54A) climbs a ridge through Nantahala National Forest to Bob Stratton Bald. One of the lush mountaintop meadows the Southern Appalachians are known for, Bob Bald as it is called, straddles a boundary between Citico Creek Wilderness and Joyce Kilmer-Slickrock Wilderness. During the green seasons Bob puts on a dazzling display of wildflowers with a remarkable array of colors that rival any other of the region’s garden spots. 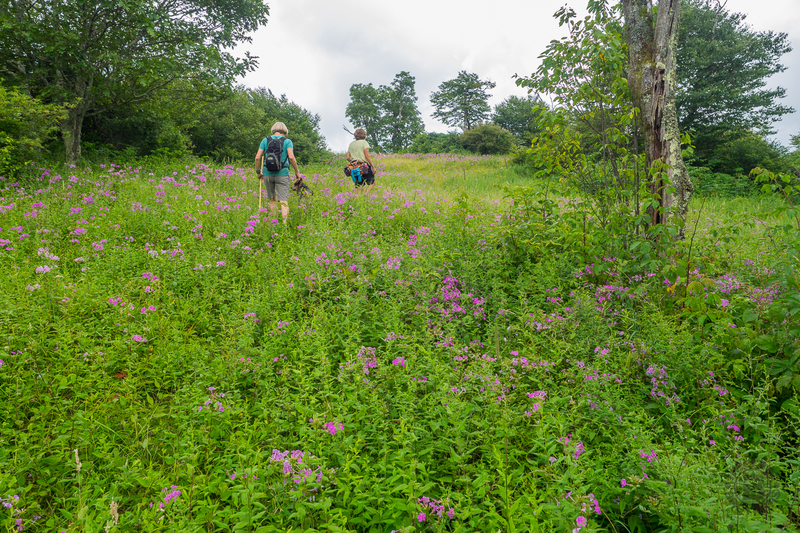 If you want to extend your hike, a web of trails take off from Stratton Bald enabling you to explore the wilderness territories and Unicoi Mountains that surround you. I met a group of Tennessee hiking friends on Sunday, July 26, 2015 for my first hike in this area. We started about 10:45AM and finished at 3:45PM. Our plan was to climb the Bob Bald Connector Trail to Bob Stratton Bald, then return. I also intended to visit the Joyce Kilmer Memorial Forest after leaving the group so I could witness the giant trees. Hike Rating: Moderate. There is about a mile of strenuous climbing included. Trail Condition: The first 2 miles are along sometimes muddy Forest Road 217H. 54A Connector Trail takes off from the end of the road and is single track and sometimes a bit overgrown in summer. Otherwise a good trail. Starting Point: Parking area at Beech Gap on the Cherohala Skyway. Trail Traffic: We encountered four other hikers in two groups. How to Get There: From Asheville, NC take I-40 to exit 27, the Great Smoky Mountains Expressway. Continue south/west 49 miles. Not far past Bryson City, turn right on NC-28 for 11.5 miles. Turn left on NC-143 8.8 miles to Robbinsville. Turn right on US-129N/NC-143 for 1.5 miles then turn left on NC-143. Follow this 25 miles to the Cherohala Skyway, then it is another 15 miles on the Skyway to Beech Gap at the North Carolina/Tennessee state line. The Cherohala Skyway crosses through the Cherokee National Forest in Tennessee and the Nantahala National Forest in North Carolina. “Cherohala” comes from the names of the two National Forests: “Chero” from the Cherokee and “hala” from the Nantahala. Located in southeast Tennessee and southwest North Carolina, the Skyway connects Tellico Plains, TN, with Robbinsville, NC, and is about 40 miles in length. Elevations range from 900 feet at the Tellico River in Tennessee to over 5,400 feet near the state line at Haw Knob. It’s a delightful way to start your day whichever state you’re coming from. There are several overlooks along the Skyway that offer photographic opportunities as well as trailheads for exploring the surrounding mountains and wildernesses. Most of these are labelled with a name and a sign, but the trailhead for this hike is not. The trailhead is between the two state line welcome signs at a place called Beech Gap. If you are coming from the NC side, it is on your right, the next pullout after the Benton MacKaye Trail crosses the road. This pullout is a forest service road with a gate, and there is room for 4-5 cars to park. I was delighted to be meeting up with a great group of folks from Tennessee that I hiked with a couple times last winter, and I was excited to be exploring what was completely new territory for me. Despite having lived in WNC for a decade, I just hadn’t made it yet to this very farthest corner of the state. I’ve always wanted to, since hearing of the giant trees found in Joyce Kilmer Memorial Forest. Serendipitously, I had even purchased a trail map only a couple weeks before. So when I was asked if I wanted to come, I jumped at the chance. For the first two miles of this hike you’re on Forest Road 217H, passing along a ridge that demarcates Cherokee and Nantahala National Forests. On your left is Cherokee as well as Citico Creek Wilderness, and on your right is Nantahala. The road is lined in July with stunning bee balm, a native wildflower also known a monarda. We were treated to white ones, crimson ones, purple, and maroon. The name is certainly appropriate as the constant buzz made us aware of the bees getting drunk on nectar. The forest road is on such a gradual decline that you hardly notice it. However, you will notice it on the way back when you are going uphill instead. There are low spots in the road where puddles and mud collect. Otherwise, it is a comfortable trail, one that meanders through dense hardwood forest. Eventually the road dead ends, and a series of trails fan out from the cul-de-sac. This is the trail junction at the end of Forest Road 217H. 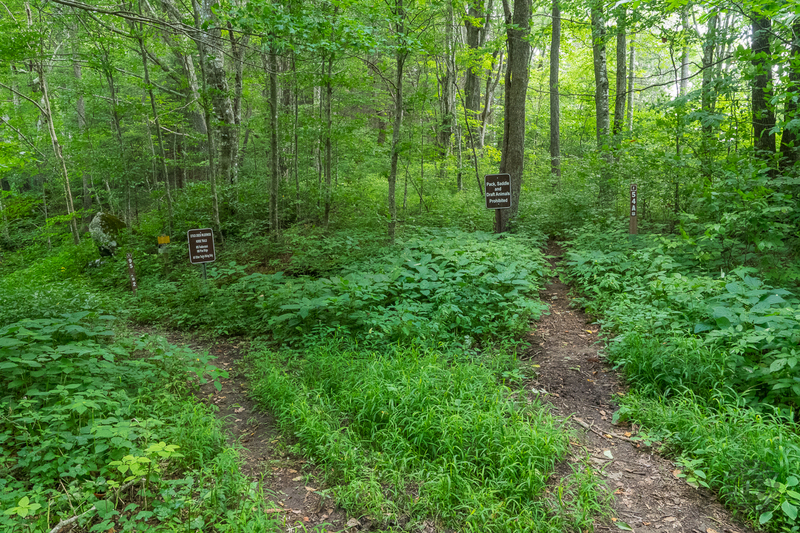 The trail for this hike is the one on the right, labelled 54A, and named the Bob Bald Connector Trail. Now it’s time to climb. For the next two miles the trail gains more than 800 feet. There are occasional brief level stretches along the way, but if you just grit your teeth and prepare for the exertion, it will be over in about an hour. In the meantime, enjoy all the wonderful sights like massive chicken of the woods fungus and clusters of turks cap lilies. Ferns dominate each side of the trail, and this time of year they are bright, bright green. The single-track trail gets considerably more narrow the higher you get… some due to the terrain, and some to the plants encroaching on the tread. As summer continues to progress, many of the berry-type plants make themselves known including carrion plant and witch hobble. The snake root was in abundance as well. About two thirds of the way up you will pass through a dense and dark rhododendron tunnel. There are more rocks and roots too, so with the combination of overgrowth and tripping hazards, watch your step. An occasional seep will be enough to give your pooch a drink, but probably won’t refill your bottle. Speaking of our furry little friends, it was nice to once again have Cowboy the Australian cattle dog along to keep us all in line. You can tell when you are almost to the top when you see tall grass along each side of the trail. It is spreading from the bald and is a nice signal that things are about to get exciting. You will first pop out of the woods to a small meadow on your right with a picturesque view of the Unicoi Mountains. There were hundreds of blooming phlox, a mere sampling of what was yet to come. As we marched about another hundred yards we reached the true mountaintop, a broad open expanse of grassland that was awash in a radiant fuschia glow. This was the largest field of phlox I had ever witnessed! Tens of thousands of these beautiful native wildflowers filled the senses. Add to that hundreds of turks cap lilies for quite an array of color. Gretchen even found a teeny, tiny club spur orchid hiding deep within the mountain grass. Marti and Gretchen entering Bob Bald, an ideal setting for an Appalachian version of The Sound of Music. There are blueberries on Bob Stratton Bald too. They were still a month away from being ripe, but it looked like a healthy crop of the sweet tasting morsels. The elevation here is above 5,300′ and a delightful summer breeze kept us nice and cool as we found a semi-circle of logs to sit and have lunch. Off to the north are the massive shoulders of the Unicoi Mountains, and to the east the tall dead trunk of an oak with a rope dangling from the top. We called this the Hangman’s Tree. That’s the picture at the top of this post. The bald is named for Robert Stratton (1825-1864), whose family lived there in the mid-19th century. Bob’s father John Stratton (1799–1862) settled in the area now known as Stratton Meadows (atop the main crest of the Unicois near where Cherohala Skyway crosses the state line) in the 1830s. Bob eventually moved a few miles north of Stratton Meadows to the mountain that now bears his name. While on Bob Stratton Bald you are in the Joyce Kilmer-Slickrock Wilderness, designated in 1975 and totalling 17,394 acres. There are other pathways that reach the bald within the wilderness including from Wolf Laurel where the Bob Stratton Trail climbs up from the east, and another that climbs Fork Ridge from Swan Cabin. The Fodderstack Trail continues northward for several more miles along the state line to Big Fodderstack Mountain. Guarding the north edge of the bald is a beautiful stand of fraser fir that was planted decades ago when the woolly adelgid first began to pillage the fir and hemlock in the Great Smoky Mountains. So far (knock on wood) these have avoided that nasty fate. We hated to leave Bob Stratton Bald. There are times when you are fortunate enough to be at a place on the perfect day for a seasonal display. That seemed to be the case for us on this day with the sensational natural garden. We had a great memory to take with us as we returned the way we had come. The connector trail actually seemed steeper on the way down, so be aware of the potential wear and tear. Remember too, that some of the forest road goes gently uphill, so if you are tired you’ll notice it. On the way back I talked with some of the others about how to find the Joyce Kilmer Memorial Forest. I wanted to see the big poplars. As it turns out, it was quite easy and best of all, right along the way. When we got back to Beech Gap I said a fond farewell to my Tennessee hiking partners with a promise to get together again soon. I drove down the Cherohala Skyway to the entrance, then took a left. From there it is only two miles to the memorial forest. This forest is one of the Nation’s most impressive remnants of old growth. The woods contains magnificent examples of more than 100 tree species, many over 400-years-old, and some more than 20 feet in circumference and 100 feet tall. This 3,800-acre forest was set aside in 1936 as a memorial to the author of the poem “Trees,” Joyce Kilmer, who was killed in action in France during World War I. This forest, part of the Joyce Kilmer-Slick Rock Wilderness, is maintained in its primitive state. The only way to see the forest is on foot. 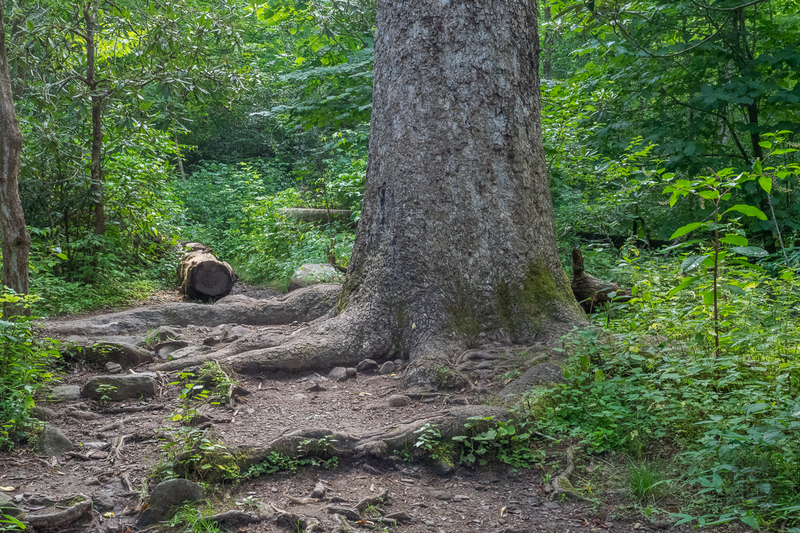 A 2-mile trail leads to the Joyce Kilmer Memorial and loops through the giant trees. Unfortunately, there aren’t as many as there were when the memorial was founded. The immense American chestnuts were the first to succumb to blight, and the hemlocks have most recently been devastated by the woolly adelgid. Only the big tulip poplars remain. On the long drive back home I had plenty of time to reflect on this wonderful day. I have no doubt I will be back to this corner of Western North Carolina many times. It is quite a long way from my home, so it may be better with overnights included in the future. The Cheoah Ranger Station for Nantahala National Forest is right along the way west of Robbinsville. There is still so much to see and do. I only began to scratch the surface of this remote region of wildernesses. I passed literally dozens of trailheads right off the roads to and from. If you live in Eastern Tennessee, Western North or South Carolina, or North Georgia or Alabama, I highly recommend you get a trail map that includes Joyce Kilmer-Slickrock Wilderness and Citico Creek Wilderness. Then, get out there.